a few weeks ago i got an email from a wonderful woman from moda (yeah THE MODA ) asking if i would be interested in posting some tutorials over at moda bake shop. first, i swore out loud (going to have to repent for that one) then i was like "this has got to be a joke." then i looked around to see if there were any hidden cameras and some annoying dude hiding somewhere ready to come out and yell "HAHA! you are on tv bloopers and practical jokes!" but no one did...and so i re-read the email and i replied "sure i would." (trying to play it and sound all cool) and then immediately started to have the desire to blow chunks. (that feeling hasn't really stopped yet...i mean it's MOOOOOODAAAAA people! )anyways here's my first tutorial for moda bake shop. i don't feel like i can hold a candle to any of the other ladies doing the tutorials over there, maybe i'll just be the village idiot, but either way, i consider myself lucky. so thank you moda for the opportunity. since so many wanted to know how i made my first rag rug for the little one's bedroom, and i didn't feel comfortable giving crochet instructions (heck, i can't even follow them without someone holding my hand) i was inspired by the wool braided rugs and came up with this tutorial. i think from now on i'll make all my rag rugs like this...and yeah i'm going to make one for like EVERY room, maybe even two...i'm even thinking of making them for my etsy shop. so go on, go over there and give me some love and help my stomach calm down some! Congratulations!!! How exciting and I love the bake shop, so much good stuff going on over there! As my teenagers would say..OMG! That is seriously on the cool side of things. Congratulations and enjoy! How wonderful for you to receive this recognition. Congrats!! Yeah for having that kind of experience! It pretty much confirms that you are the coolest person I know. The rug is way cute. I will have to go over and check out the tutorial. Congrats! i told my hubby the other day that you were gonna be on moda bake shop!!! p.s. about bartering...maybe a charm pack??? idk. Glad I knew you before you became famous!! :)You are too talented...I love it! Am heading over to the bakeshop right now! You will do great!! V... you are so cute! Awesome tutorial! Can't wait to see what else you come up with! Thanks for being a part of the MBS! The tutorial is so SO good! Way to go, CONGRATS, Yipee! Now you're famous, wow. Wow - AWESOME tutorial, and congrats on it being over at MODA! Having just gotten my first pile (and I mean PILE) of Moda fabric this past week, I can definitely appreciate it a lot more;) I have wanted to make a rug like that, but have been totally afraid of the crocheting - so THANK YOU for this one! I'm totally going to make one! Your tutorial is so clear and doable! Great job explaining things. Moda needs YOU! Great tutorial! Major Congrats on your MBS debut! Awesome! I think I may have to make a few of those rugs- beautiful! Can't wait to se what you come up with next! Congraturations on your Moda Bake Shop debut! The rug looks awsome and I love the colors you did. Vanessa, congratulations on scoring the opportunity with Moda. I am a Moda freak as well. 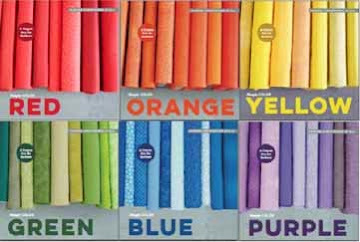 Everytime I walk into a quilt store the fabric I gravitate towards is always Moda. Can't wait to check out your Moda Baking Shop tutorials. Thanks for the comment on my Breakfast in Bed post. Due to your comment I am doing a post on the quilt tomorrow...so stop back. V~I love it! I am saving and stripping old jeans to make a rug for my boys room. This was just what I needed. :-) Thanks! You know, for someone who was afraid to try crochet, this turned out AWESOME. I'm very very proud of you! congrats!!!!! i'm SO happy for you. you did great on your tutorial. :) i would love to make one of those rugs today, they are so great! That is great Vanessa! Congrats! I hope you guys are still coming up this weekend...I cant wait to see you! Congratulations!! That is so neat and ty for sharing the tutorial it looks like fun! Congrats! I love your tutorial. I've been wanting to make one of these! Congratulations! What an accomplishment! Now I have to try your rag rug, it looks fantastic. V congrats!! You are so very talented it makes me sick!!! ;0) Love everything you do and how easy you make everything seem, it gives me a little hope that maybe just maybe I can create to!! Congrats!! That is really amazing. I love your rug...I'm thinking of attempting it, but not sure. Your rug is adorable and the tutorial is amazing. I'm going to have to read it again though and see if I could REALLY do this - but I think I can. SO cute! I. Am. Inspired! And so excited for you! You're practically famous! 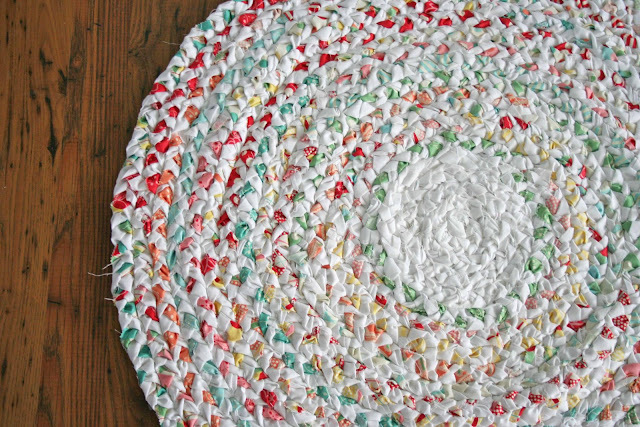 I am going to WOW my friends and family with my own braided rag rug... Thank you SO much for this tutorial! It's FAB! WOW! How absolutely wonderful for you. You have so many wonderful ideas on your blog that I am not at all surprised that MODA picked you. Way to go! I am heading over right now to view your tutorial. congrats!!! I just saw your tutorial on the bake shop and that rug in fabulous! and what i love about it the most is that you don't need to know how to crochet. Also we have something in common we both know the zitzman's. oh my gosh!!! MODA! THAT'S AWESOME! That's like any "material girl's" dream V! Good job! You're awesome! Oh my heck! I saw it at the bakeshop first and hollered out loud! I am so proud of you. What an amazing opportunity. You go girl! Congratulations! It's a gorgeous tutorial. I'll be linking to it later today. congrats on the moda, adorable rug, and i didn't put my two bits in about the chair. i thought the 'blue' and 'yellow' ideas that you got were the most exciting and creative. now white, black, or red seem so boring! i can totally picture the robin egg blue or with just the right yellow i think it could totally work. good luck. so cool! congrats. and you hereby have our support. so, just so you know... you are gonna be great! off to see you at Moda. hey email me from your email address, pretty please. i have a proposal for our swap. Your tutorial was great and definately on par with the other designers. Congrats! how very cool for the recognition! i even think i can make that rug too! congrats! Good for you!!! You are big time now! So pretty! Congrats to you! Wow, congratulations!! i was thinking about you the other day and how amazing your blog is. I'm glad that others have picked up on your talent. I LOVE the colors in your rug!!! It is beautiful. Yay for you! That is so cool! And the rug is so cute! Oh you are such a stinker, all that worrying and your tutorial ROCKS? How does that work?? ;-) So proud of you- love the rug!!!! Really, LOVE! Hooray for you! I vote V as the super coolest! I loved the rag rug.... I saw you first one and fell in love. Especially the scalloped edge. Can I ask what hook size did you use? Way to go! I love the tutorial. I've always wondered how those rugs were made. I just might attmept it myself. And thanks for the kind comment about my age on my blog. LOL. 30's? You are way too nice. To remove any more misconceptions, I am old enough to be a gramma, I'll be 48 next week and love everyminute of this middle age, empty nest portion of my life! Thanks for linking with Mother Hen's Homemade Thursday! Lovely rug. Can I ask for a link back to Ship Full O' Pirates for the Homemade Thursday? I think I just fell in love/lust for this rug. I'm in search of the right honey buns to make this and was wondering if you could perhaps tell me what the final size is on this one so I can judge how many honey buns to get. I am in love with this (and your blog!) I think I might have to give this rag rug thing a try. Vanessa, first let me say you rock and I'm totally inspired by this tutorial so I've ordered a honey bun. It arrived and is starring me down as I sit here and procrastinate,,,lol,,,all those darn what if's. I've studied this tutorial and only hesitate on one thing and that is when you slit the pieces to add new strips, am I going over and down or just straight up through the hole? Perhaps I should just sit down and give it a try. Nice blog, here is some more information on Kid Rugs. Another great tutorial! 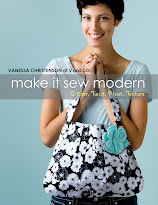 I'd like to share a link to this tutorial on sewwhattoday.blogspot.com on January 10! I want one in my kitchen! this is so particular but to me I really like this rug, it is so colorful than everybody is going to enjoy this and will feel comfortable with it.